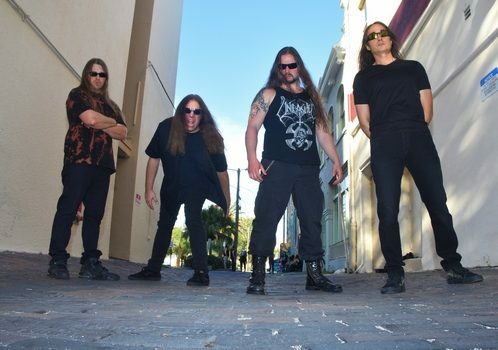 While they may never have shot into the death metal stratosphere like other Floridian bands before them (Obituary, Morbid Angel, Death), Monstrosity have been rolling out their particular form of extreme music since the early ‘90s with no compromise. Arguably more on the technical end than some of their peers at the time, Monstrosity have always brought a balance of good ole brutality mixed with some superior songwriting and subtle melodies. While it’s been quite some time since we’ve heard from the act (2007’s Spiritual Apocalypse being the last full-length), the band’s members have stayed busy, and we are about to see the latest fruits of their labor in The Passage of Existence. We had a talk with drummer Lee Harrison about the gap in time, the glory days and impact of the Florida scene, and how extreme drumming continues to evolve, in addition to some chat about the album itself. Dead Rhetoric: It’s been 11 years since Spiritual Apocalypse. Outside of the dvd release in 2012, what has the band been up to in the years between? Lee Harrison: Personally, I have been doing other things here and there. I would say that we started writing around 2011. That was when we really started working on it. Then we spent 2-3 years working on the material, and started tracking the drums in 2015. It’s been three years in the making. In the meantime, I worked with former Crimson Glory vocalist Midnight before he passed away. We recorded 60 songs – basically an entire discography. He had an idea that he wasn’t going to be around forever and we sort of captured all of his ideas before he passed away. That was different, unique, and very rewarding for my creativity just due to the fact that I played drums, guitar, bass, I played a little of everything. It was fun having an awesome singer, who I could hang around with and strum a few guitar chords and write a song that way. Or we could just record a bare-bones acoustic track, have him sing over it, and then build something around that. Build a big musical piece around it. So it was really good for my creativity and be able to explore ideas and do different things. So that was what I did between 2007 and 2009. In 2011, I started working with the Tardy brothers from Obituary on their side project, which is called The Tardy Brothers. They recorded an album and I learned it, and we were jamming it in the band room. That led to me doing some guitar work with Obituary in 2012. I ended up going to South America with them and played guitar. We went to Ecuador, Brazil, Chile, Mexico City, and a few other places. That was fun, and killer but they needed a really strong lead player, which I’m not. I’m more of a rhythm guy. So I understood when they ended up getting Kenny [Andrews]. He had been on tour with Matchbox 20 as a guitar tech, and he works with Trivium as well. He does other stuff too, so while he was doing that I more or less filled in for him. That was 2012, and then around 2013-2014, I started working with Pete Sandoval doing Terrorizer. That was a happy accident of us just starting to jam and things seemed to work. Terrorizer ended up taking a different turn then where they were previously, because it was a different line-up and they weren’t really touring. With Pete, we are able to tour and we have a new album that’s coming out soon on The End Records. It’s totally finished and ready to go. So yeah, I’ve been busy doing other things but to be honest, like I’ve said in some other interviews, it really hasn’t affected Monstrosity. The things that have slowed Monstrosity down have been other things, like dealing with the recording. Mark English took his time on different things and getting his leads worked out for the album. It just took time – it’s finally done and people can start to hear it, and we are happy with the final product. That’s the most important thing. It took longer than expected, but in the end, the product is what we want, so it’s hard to complain. Dead Rhetoric: Do you feel that your own personal experiences along the way influenced your approach to new material at all? Harrison: Maybe, maybe not. It’s hard to say. For me personally, I tend to have set ideas on what I want to do. Mark English likes to tear it down and build it up again. I don’t mind that either, and do it sometimes myself, but he takes it to another extreme. In that respect, it’s just more of that – we will work on something and it will be done in my mind, but he’ll want to tinker with it some more. Sometimes we end up with a completely different song. I usually just go with it instead of trying to fight it. I go with where people want to go, and experiment with it – I’m not against that. It usually comes down to what works best and hashing it out. Going the extra mile is worth it. Dead Rhetoric: Do you find that fans stuck with the band even with a bit of a drought with material? Harrison: Totally. At this point, we probably have a whole new generation of fans we didn’t have. Before Facebook and YouTube, even as far back as Myspace. Before all that, it was harder to gauge and for people to be exposed to what we are doing. Now you don’t have to spend money to hear us – then you would have had to buy the album, or be exposed to it through tape trading. It was harder for the casual fan to hear us, whereas now there’s YouTube and whatnot, where things get spread around quick. So with that, I knew that as long as we made sure that people like John Dwyer and some others know about it, I trust the word will get out. As long as the main players in the scene know, the fans will hear about it too. Dead Rhetoric: From my perspective, I was just getting into heavier stuff in the time prior to Millennium coming out and I remember having to search and search to try to find it on release. Harrison: Now it’s a lot easier. The whole album is out on YouTube now, so it’s like, “How easy can you make it?” It just helps us in the overall awareness of the band. It’s too bad that we lose out on some record royalties by not selling as many cds as we used to, but we sell shirts and stuff, so there’s that. There’s just more awareness for the band with the Internet. Dead Rhetoric: How do you feel The Passage of Existence represents Monstrosity here in 2018? Harrison: It’s the next chapter in what we do. It’s a natural evolution to me. To some, it might be totally different. I know it’s more melodic than our first album. From there, we have always had melodic bits, but we’ve always kept the brutality. This album is no different. We like to keep things brutal, but at the same time, we went where we thought we needed to go as far as experimentation and not being afraid to go there. We aren’t putting out a dance record either. Dead Rhetoric: Most of your older albums were all recorded at Morrisound Studios. What was it like to record elsewhere this time? Harrison: Basically the story there was that the Trans-Siberian Orchestra guy, Paul O’Neill, was spending 6 months of the year at Morrisound Studios so he figured with all the money he was spending he should just buy the place, and then unfortunately he passed away. So the studio is no longer the studio. So we were sort of forced to go somewhere else. We worked with Jason Suecof at Audiohammer on the Rise to Power album. Our bass player [Michael Poggionne] actually worked with him in a project called Capharnaum. So that’s what I first heard from his studio and thought it sounded amazing. The original plan was that the price would be better than Morrisound and we would still get a good product. He’s a friend of ours too, but it was also an hour or two away from where I live. You have world class Morrisound right there, so we did Rise to Power with Jason but went back to Morrisound because it was easier for Spiritual Apocalypse. But for this album, we knew we had to find a different studio anyway, and to be honest, I heard the Job for a Cowboy and the production that he did, just on one song “Sun Eater” and it was mindblowing. I loved the bass and drum sound, and the production was great. We wanted to capture, if not beat, that production. So it kind of worked out in our favor that Morrisound was no longer. We wanted to step things up with sound and I think we did it. I’m really happy with the production. Same with the Terrorizer record. We did that record there too, because things had gone so well with Monstrosity. I’m really happy with Jason Suecof and Audiohammer and how it all turned out. We were one of the last bands to use a particular drum room that they had, which was a great log cabin built by some old man. It was great, but for whatever reason they ended up selling that part out, so he’s building a new drum room in his back yard. Maybe on this next album, we’ll figure out what’s going on in there. Dead Rhetoric: What do you think defines Monstrosity as a death metal band in terms of your sound and approach? Harrison: At this point, I would say songwriting. We are trying to make really great songs. Catchy but brutal, listenable and still keeping the heavy parts that the band has always had. So it’s definitely more songwriting than making something that’s more just to show off. Dead Rhetoric: What do you see as the way that drums have evolved within extreme music? Harrison: Kind of the way I predicted. Right now, there’s probably some 16 year old kid that’s just hearing Altars of Madness or Cannibal Corpse for the first time. He’s going to sit in his bedroom for the next 5-10 years and just get phenomenally good, and push the human boundaries of drumming to another level. I kind of talk about it in my drum talk interview that I just did – back then we didn’t have a rulebook. Now you have YouTube and everything. Kids can come out of the gates with all the lessons that we had to learn rule by rule the hard way. So to me, there’s going to be a 16 year old kid that is going to come out of the woodwork and be phenomenal. Back then, we didn’t think 230 or 240 [bpm] was possible. These speeds were like wickedly fast. Now you have these kids with the metronome and they can do 300bpm like it’s nothing. To me, where’s the 330 or 360bpm? What wasn’t possible back then is normal now. Slayer was fast, now Slayer is considered pretty slow in the overall scheme of things. That’s just talking about speed, but you can also apply it to the technique of drumming and what the hands can do. The levels can be pushed and hopefully we did our part in expanding the limits. So that the next generation can come along and take it from there. Dead Rhetoric: What do you view as the role of your label, Conquest Music? Harrison: Right now, it’s pretty much handling the back catalog of Monstrosity and the merchandising. I’m also releasing the Midnight stuff I did, and I have some other ideas for the future. But as far as signing new bands and stuff, it’s hard because a lot of the money I would spend on it ends up going out the window, to be honest. It takes a lot of money to run a label and do it the right way. To actually get the records in the stores and do it all, it requires money and advertising and all that stuff. To be honest, right now the business is just so weird with what you are actually getting back versus what is going out. It’s vital for the merchandising and the back catalog, so I’m going to continue on with that and keep pushing forward and doing what I do. Dead Rhetoric: What do you recall from the early days of the Florida metal scene? Harrison: There was a huge wave in the beginning, of mainstream if you will, because stuff was being played on MTV and the labels were looking towards Florida for other bands to sign. So you had a little spotlight on the scene, but after a while it sort of dried up and it became more of a do it yourself sort of thing, because there was so much saturation with the bands and labels. At one point, it was almost a hindrance, unless you had already been signed. If you were a new band coming up, it was hard because of the saturation level. It still seems like that, but there’s a lot more variety. The younger bands are trying things in a new vein. They mix it up more with singing and screaming, or whatever. It’s not the “Florida thing” if you will. 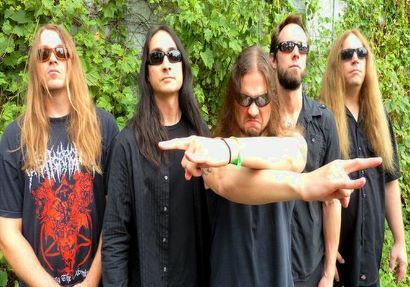 Dead Rhetoric: Do you feel that it was tougher for Monstrosity, because of bands like Death, Obituary, Morbid Angel, and Deicide coming out a little earlier? Harrison: We were definitely inspired by that. I was in Malevolent [Creation] back when it was first happening, and Obituary had an album out, Morbid Angel had an album written and coming out, Death had an album out, Atheist had a recording, so there was all of this stuff coming out in Tampa, and it was all based around Morrisound. We were driving up from Fort Lauderdale to Tampa and kind of meeting people from Morrisound and the other bands. It influenced it some, and made it more ‘death metal’ and less thrash. Thrash was already happening and it was time for that next thing to hit. It was just starting to hit when we met with the Morrisound people and started doing records. Dead Rhetoric: Why do you think the Florida death metal scene was so impactful? Harrison: Well, its like any way. There are trends that happen. There was Bay Area thrash when we were coming up, then it turned to Florida. From there you had New York and Sweden, with Entombed, Dismember, and all that. At a certain point, the Bay Area scene became so saturated that there was nothing left. Something new and different was happening with Florida, and I think that’s what brought the eyes and spotlight for the moment. It was the heaviest and hardest at the time. It was the most brutal. It was also the way it was being recorded. Scott Burns and Jim Morris and the way they were recording the kick drums – that was kind of new. In the previous era, you couldn’t hear them as clear and double bass hadn’t really hit yet – it wasn’t a big thing. But double bass took more of a focus, and the drumming. In a death metal band, you had to have a killer drummer and that was the thing – Florida bands had some great drummers. 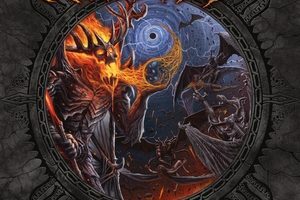 Dead Rhetoric: What are your plans for the band once The Passage of Existence comes out? Harrison: We are excited for people to finally hear the album in total. We’ve had two singles come out already, and I think this second one is more of what Monstrosity fans would expect. People are starting to get the gist of the album, but I’ll be happy once the full album is out there and people can hear it as a whole. The songs are real dynamic – it’s not 10 songs that you are hearing 10 times. There are hills and valleys – I’ll be glad when people hear it and I get some response back. It’s nice to hear what people think about what we are doing. So I’m looking forward to that as well as getting started with playing some shows and some touring eventually.